Denon makes some sweet-sounding high-end home theater gear, and now the company's adding to its headphone line with five different models priced from $50-$700. Our favorite are the $700 AH-D5000 with genuine mahogany earcups. Not sure if that makes a difference in the sound, but they sure do look purdy. You can get the similar AHD-2000 cans without the mahogany for $350. Then there's the open-air AH-D1000s that are lighter and a bit smaller, and they're easier to carry around with you. 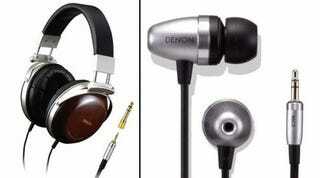 Denon also announced a couple of earphones, the $200 AH-C700 pictured here and its $50 brandmate, the affordable AH-C350. The company says all should be shipping by the end of this month, and are now available for pre-order at Amazon.